First Portadown Company Boys’ Brigade Old Boys’ Association celebrated their 80th Anniversary with a special service in Thomas Street Methodist Church on Sunday, February 24, 2019. In attendance was the Lord Mayor of Armagh City, Banbridge and Craigavon Borough Council, Councillor Julie Flaherty, along with other council Aldermen and Councillors, as well as public and volunteer organisation representatives. The preacher at the service was the Rev. Mark Durrell, a former minister on the Portadown Methodist Circuit, now serving the Church in Maguiresbridge, Lisbellaw and Tempo. The Call To Worship was given by the Rev. Thomas Stevenson (Old Boys’ President) who also led the service, while the prayers (Opening and Intercessory) were offered by the Rev. 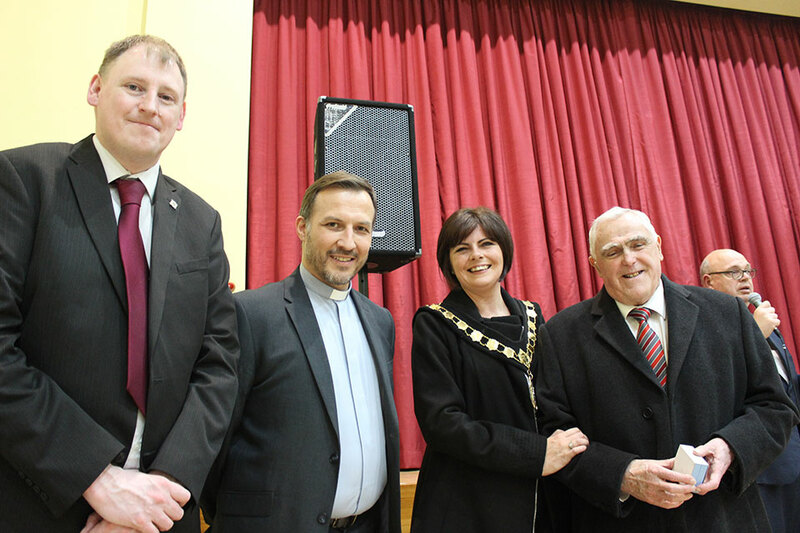 Alan Wardlow (Superintendent Minister, Portadown Methodist Circuit) and the Rev. Sharon Connor (Secretary, Portadown Methodist District). Scripture readings were read by Mr. David Blevins (Northern Ireland District Boys’ Brigade President and former Captain of First and Sixth Portadown Boys’ Brigade Companies) and Mr. Bertie McAfee. The special music was provided by Portadown Salvation Army Band and Songsters. Mr. Ryan Harris was the organist while Mr. Paul Cranston was responsible for the PowerPoint and Sound. Following the service, supper was served by members of Thomas Street Methodist Church’s Catering Team. During the supper, a presentation was made to Mr. Albert Mc Nally, a former Captain of First Portadown Boys’ Brigade Company on becoming an Honorary Vice – President of the Old Boys’ Association. The Rev. Alan Wardlow ended the evening in prayer.